Trinity Med Day will take place on Friday, November 1st and the students of the college’s medical school will take to the streets to pick the pockets of Dubliners in the good cause of their teaching hospitals. Two of the beneficiaries of the students’ annual collection will be the cancer service at St. James’s and The National Burns Unit. 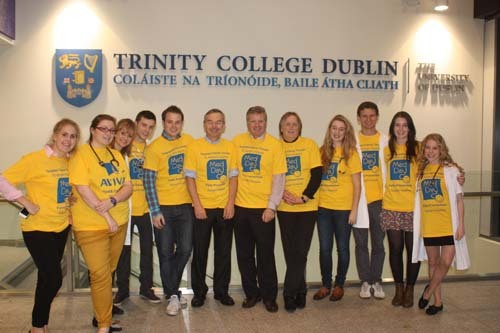 About 500 Trinity College medical students will be on the streets of Dublin on November 1st between 7 am and lunchtime to undertake this major street collection. In addition to the street collection, the students will also undertake other fundraising activities on campus including a talent show and a raffle and a bake sale. Aviva Healthcare, Lundbeck and Leo Pharma are among the day’s generous sponsors. Funds received from Trinity Med Day in connection with the cancer service will be used to support a pilot study that will be conducted by Dr Stephen Finn to provide early access testing for critically ill patients with late stage lung cancer as an initial step towards allowing this testing to be provided for all cancer patients. St. James’s is the largest single provider of cancer treatment in Ireland and is the largest national centre for radiotherapy service. A major new government funded Cancer Care Centre and Radiation Oncology Centre is now open on the site and a facility for PET imaging for advanced patient diagnosis is open – the first such facility within a public hospital in Ireland. For more information about Trinity Med Day, please visit www.tcdmedday.com.